Relax and rest in the opulence of 37 distinctively styled guestrooms, take in the high ceilings and the cast iron roll top baths. Wander through the fine settings of the Library Bar, the Sli Dala Restaurant - rated Best Hotel Restaurant in Offaly 2016 - and the Drawing Room, all with magnificent character. Relax beside unique open fires, enjoy the best of local cuisine prepared by the Head Chef, Mark Conneely - Best Chef in Offaly 2015. 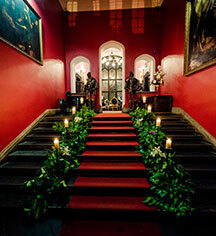 For couples seeking a unique backdrop for their very special romantic day, look no further than Kinnitty Castle. The dedicated team will assist in all the details and offer the award-winning Moposa Wedding Service for the perfect castle wedding in Ireland. While staying at Kinnitty Castle Hotel in Offaly, explore the local cultural attractions and savor the delectable cuisine. The hotel and staff have a reputation for being one of the most luxurious castle hotels Ireland has to offer and can provide everything for a memorable stay. Kinnitty Castle Hotel, a member of Historic Hotels Worldwide since 2017, dates back to 1209. Chef Sandor likes to carve faces on the trees and his work can be seen when driving up the winding avenue to the Castle. Sandor is an extremely gifted fruit carver and loves Halloween and pumpkins. Age Requirements: Guests are required to be 18 years or older with photo identification to reserve a room and check in. Cancellation Policy: 48 hours prior to day of arrival. Early Check-In/Late Check-Out: Subject to availability; charges may apply. Extra Person Fees: Charges may apply. Occupancy Restrictions: Minimum occupancy one person ( single supplement applies). Maximum occupancy (twin rooms) 3 adults or 2 adults and 2 children. Payment: All forms of payment are accepted. Payment is required at time of booking. Visa, Visa Debit, MasterCard, Amex, Diners Club are accepted. Transportation: Non-smoking guestrooms with designated smoking areas on the property. 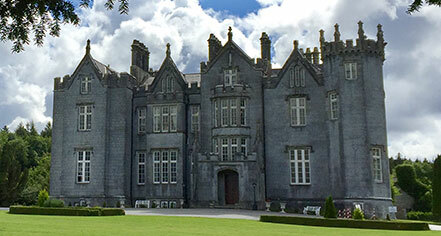 Nestled in the foothills of the Slieve Bloom Mountains, the four-star Kinnitty Castle Hotel offers luxury accommodations in the picturesque village of Kinnitty in County Offaly, Ireland. Learn more about the History of Kinnitty Castle Hotel .